Someone lost their marbles over 100 years ago at Old Bridge Inn in Mernda. Luckily, archaeologists from Dr Vincent Clark & Associates were able to relocate them in the 2017 excavations. The Inn was one of the earliest businesses in Victoria located outside of Melbourne. The marbles may indicate the presence of children, with dolls and other items associated with children also being found at the site. It is also possible that they could have been used by adults for gambling (it was a pub after all). Marbles in the 19th century were largely made by small cottage industries in Germany, but small numbers were also produced in the USA and Britain. 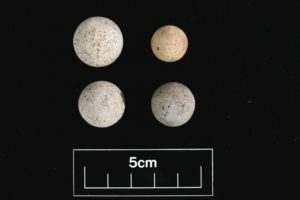 The marbles shown here are made from earthenware, and are lightly glazed. Porcelain marbles (commonly referred to as ‘chinas’) are much more collectible and are made from high-fired kaolin/feldspar clay and were produced in Germany from the early 1800s. This is a small part of the many great finds at the Old Bridge Inn!